We’d love your help. Let us know what’s wrong with this preview of Space Boy Volume 2 by Stephen McCranie. To Amy, everyone has a flavor. Jemmah, her best friend from the colony, is the flavor of pineapple and jalapeño. Cassie, from Earth, is like red pepper. After being forced to leave A sci-fi drama of a high school aged girl who belongs in a different time, a boy possessed by emptiness as deep as space, an alien artifact, mysterious murder, and a love that crosses light years. After being forced to leave her space-colony home when her dad was fired, Amy starts to adapt to a new life on Earth. High school seems difficult at first, but a close group of friends begin to make the transition easier for her. To ask other readers questions about Space Boy Volume 2, please sign up. Have I mentioned that this series is so much fun? Bc IT IS SO MUCH FUN. Wow, just wow! What a great follow up to the first Volume. I loved getting to know more about some of the characters. Also theres finally a book in my collection with some great parent/child relationships! This book definitely deviates a bit from how our main characters is able to detect flavors from people, which was one of my favorite things about the first one. But theres a lot added to this volume that make it very interesting none the less. Cant wait for number 3! Still slow-paced, but still fairly engaging. Some progress was made in connecting the main character with the title character. As for the art, it's a little odd how males get to have flat feet but females all walk around en pointe. I’m really enjoying this series. It’s very slow and more like a slice of life manga than anything else. The art style is beautiful, the art has movement and the writing is good. Overall I’m very please and can’t wait until the next installment in March. That said, I’d read these in one go, they’re not “loud” enough to keep me interested and waiting for 3/4 months at a time, but if I had all the issues and could read them over a week that would be best. LOVED this installment in the Space Boy series and I’m dying to know what Oliver’s flavour is. Actually, I’m dying to know more about Oliver - he is quite the mystery! Amy finally manages to talk to the white haired boy she noticed in the first volume of this delightful story of a girl, who is both out of place, and out of time. And Oliver is a bit like her. He seems to be dislocated from life, and although Amy can sense a smell about everyone else, Oliver has no smell. "Once I accepted the nothing, I felt nothing, and that was a form of freedom," he says. One reviewer said it was a slow story, but if you are reading it as a race, yes, it might seem slow, but we Amy finally manages to talk to the white haired boy she noticed in the first volume of this delightful story of a girl, who is both out of place, and out of time. One reviewer said it was a slow story, but if you are reading it as a race, yes, it might seem slow, but we are seeing everything through Amy's eyes, a life she has only seen in movies, and one she is still adapting to. Oliver: "Sometimes hope hurts too much to hold on to." THIS SERIES IS SO GOOD. I cannot wait for book three to get to the local library! I am enjoying this series and I really like the art. This book picks up immediately after the ending of the first book. We follow Amy trying to get comfortable to Earth and having more dealings with Space Boy. Solid one and I look forward to reading more from this series. oooo I love Amy & Oliver! This one mostly just has their interactions, nothing but a sprinkle of "whaaaat is going on???" in this volume. Well, it was a book! There's a bit of character development, a tiny bit of progress on the plot, and one rooftop adventure, but this wasn't a wild ride. I still look forward to the rest of the series, especially seeing Amy reconnect with her old friend from the colony. In love with the gradient shifting for the story transitions. Highly recommend. I love this series so much. Great art, wonderful characters, fun/compelling storyline, and well-paced. This book is really good. It gives us more information about the boy but still keeps us suspenseful. Amy continues to adjust to life on Earth and build new friendships in this time and space. The changing of the seasons catches her by surprise, as do other little things the videos of Earth never prepared her for. She slowly gets to know the mysterious boy at school who seems to never go to any class except art class, and who weirdly has no flavor (Amy has synesthesia and everyone has a flavor...except this boy). In contrast to Amy, who is choosing to be positive and hopeful about the changes in Amy continues to adjust to life on Earth and build new friendships in this time and space. The changing of the seasons catches her by surprise, as do other little things the videos of Earth never prepared her for. 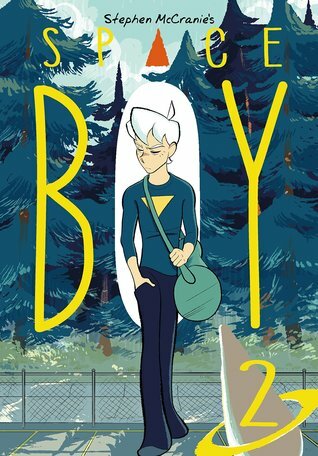 She slowly gets to know the mysterious boy at school who seems to never go to any class except art class, and who weirdly has no flavor (Amy has synesthesia and everyone has a flavor...except this boy). In contrast to Amy, who is choosing to be positive and hopeful about the changes in her life instead of dwelling on the pain of the changes, Oliver seems to have decided to totally withdraw and view his time as dwelling in the Nothing. Amy's brief interactions with him challenge him to think differently. Meanwhile, Amy continues to build other friendships while also learning about things like Earth sports and an event called homecoming. I'm so curious now about what Oliver's background is. I need book 3, but it is still on order. (I know, I could cheat and go read the webcomic but I prefer the book format.) I really like the contrast between Amy and Oliver and the way they've handled hardships they've faced. Oliver is pretty nihilistic whereas Amy chooses to stay positive and hopeful. It's an interesting read just for their philosophical conversations. But there's lots more than that. There's moments of humor as Amy is thoroughly confused by Earth sports. A boy obviously likes her but she's completely oblivious and he is still working up the guts to ask her to homecoming. And the artwork is still enchanting. Highly recommended to anyone who likes a bit of depth in their graphic novels, scifi fans, character driven story fans, TCKs (because there's still lots about adjusting to a new culture), and art lovers. I have been looking forward to this next volume since July when I read the first and it did not disappoint my anticipation for it! This series continues to have incredibly strong feelings underlying it that makes you feel as if the author Stephen McCranie is writing from personal experience or deeply personal feelings - with one of the strongest of that being loneliness. I adore Amy as a character and watching her discover new things about Earth in this volume, such as being able to see her breat I have been looking forward to this next volume since July when I read the first and it did not disappoint my anticipation for it! This series continues to have incredibly strong feelings underlying it that makes you feel as if the author Stephen McCranie is writing from personal experience or deeply personal feelings - with one of the strongest of that being loneliness. I adore Amy as a character and watching her discover new things about Earth in this volume, such as being able to see her breath when it's cold outside or the cuteness of baby chicks. I also am glad we got to learn just a smidge about Oliver (aka Space Boy) and am even more intrigued to learn about his character in the volumes to come. And I love that there is such a great relationship in this series between Amy and her parents which I feel like a lot of books in general lack so that's always nice to see. So yah, I am DEFINTELY going to be keeping up with this story. I WANT THE NEXT BOOK SO BADLY I just want to binge this entire series BUT I CAN'T because the entire series hasn't been published yet!! It's honestly so surprising to me because it's not an action packed story AT ALL, it's quite slow-moving--like you can tell there is something happening in the background, but we don't really know anything about that yet, it's still very character focused at the moment. I don't know, there's just something about this graphic novel series, it's characters, the atmosphere, that is really drawing me in! There is something really strangely lovely--and maybe the right word would be heartfelt, or purposeful--about it, even though one could argue that not much has happened yet, even in the second volume? This is why I don't really like to read graphic novels that are still coming out. Got to the end and I now need to know what happens next, only to find out volume 3 doesn't come out until 2019. The wait will be torturous! Especially since it takes a while for the books my library orders to come in. I'm really digging this series so far, but I could do without the animal exploitation vis-à-vis the school's agricultural club. Like, if you're going to show off the cute baby chicks you ordered via USPS (or future equivalent), maybe also include a panel of the unboxing, where most of the babies arrive dead, mkay. Or, better yet, let's just skip to the lab-grown meat. This was just as entertaining as the first volume. We get a little more into the mystery of the series, which is still very much mysterious, and we get to know the characters a little more. The high school stereotype stuff is still there, but just like the last time I didn't find it annoying, or too cliched, i found it fit with the story well. I also LOVE the art, and the color palettes. I still like Amy a lot, even though she’s adjusted fairly quickly to living on Earth (but kids are like that, I guess). There’s a lot more about Oliver in this collection, but there’s still a lot of mystery. Like, he might maybe be a robot or something? I don’t know, it’s weird, but I still like it. There are some really heavy things in these books, but they are so interesting to read and think about. The mysteries are starting to be more visible -- very interested to see where the story arc will go. Nothing much happens in this one but it still pushes the story forward. I'm bothered by the way the feet of female characters is drawn - I wouldn't be bothered if all feet came to impractical-looking points. I really love these graphic novels. Any is relatable in her game choices as well as how she reacts to seeing chickens and baby chicks. At least to me. I can’t wait to find out more about Oliver in volume 3! Amy meets a strange boy with white hair who attends her school. Unlike everyone else around her, this person doesn't have a "flavor." Each seems intrigued by the other, and *that* intrigues me. Eager for more! Again, I really enjoyed what there was of the story, but it doesn't seem to make a lot of progress. I have so many questions, and the story doesn't really answer most of them. I really like the characters, and the art is well done, but I'm not sure serialized stories are for me. Still loving this series; can't wait for the next volume! Stephen McCranie has been drawing comics since before he could read or write. He graduated from the University of New Mexico with a degree in Fine Arts and currently lives and works out of a small apartment in Albuquerque, New Mexico.